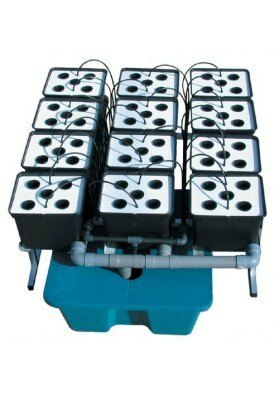 GH Water-Farm GH 15 Liters is a hydroponic integrated system harboring a square container with 15 liter substrate capability and an integrated drip irrigation system. GH Water-Farm 15 Liters is a hydroponic integrated system being one of the most popular and most sold system that exists on the market. GH Water-Farm 15 liters harbors a square container of 15 liter substrate capability and an integrated drip irrigation system that allows to oxygenate the nutrient solution, recovering it. The containers are very resistant and were developed with a UV protection systemwhich guarantees a long life service. This system, besides Marijuana plants, can be used for all types of vegetables like tomatoes, carrots, broccoli, etc. The trays have a high capacity and are able to receive plants of all sizes. To give you an idea, one bucket is enough for you to plant two tomato plants in it. Besides that, it also have instructions to help you better understand the process and therefore to better use the system.